We often encounter the world with a mind overflowing with media images and our own imaginative projections - a sort of mental ecosystem which provides a psychological environment into which we can fit our experiences. These images, these landscapes of information, contour our outlook, adjust thoughts, and have a determining effect on how we perceive the world. Raw: unaltered from its original state, not filtered or diminished in effect, exerting a forceful power and impact. This is the closest I can come to describing the intensity of the mental collision that occurred when I plunged from the cold of a Canadian winter into the powerful heat and movement of Mecca, the city at the heart of the Islamic world. Sometimes an experience goes beyond preset expectations. It piece by piece dismantles aspects of one's mental landscape or pierces through it, and overwhelms with the force of its presence. It causes a shift in perception, a rearranging of the terrain of the mind. From a society in which religion and religious symbolism exist tenuously, vaguely, on the periphery of daily existence, I fell headlong into a concentrated centre of piety, where religion and its most potent symbols exist with the compact density and power of a black hole humming at the core of a galaxy. Where the raw symbolic and attractive power of religion are laid bare, divested of dross, concentrated into essence - into pure, palpable substance. Finally my eyes fell upon the roofless central courtyard where, rising like a black monolith out of a circular plain of polished white marble, stood the Kaaba. Here was the compass point of Muslim prayers - a large cubical structure clothed entirely in a deep black cloth-covering embroidered with verses of the qur'an (a black that appeared impossibly intense against the sunlit courtyard's white marble floor). It was a magical image, an ancient image, framed between contoured pillars. And like a waking dream it shimmered in the heat of the day, appearing to slowly pulse like a heartbeat as the dense heat induced the air to vibrate and rise in invisible currents. Surrounding it was an effortlessly turning human wheel - the endless circumambulation (tawaf) of the Kaaba by the pilgrims. There was just too much to take in, too much newness, too much rich detail all around me, too much movement as I stood on the outskirts of the throngs of people engaged in worship around the Kaaba. It was all unfamiliar - my Canadian bred senses had no domestic perceptions they could latch onto to give them comfort. There was only the inadequate and incomplete jumble of impressions, images, and preconceptions I carried with me from books read, videos viewed, pilgrimage stories heard, pictures seen. I struggled to quieten my mind but my thoughts were hyperactive - kinetic. So much to process, to take in and digest. I gave up trying to marshal my thoughts into any coherent order and simply allowed the astounding visual panorama around me to flow into my consciousness. I was immersed in an ocean of religious symbols. Everything around me seemed to possess depth and weight, everything emanated an impression of great substance. The architecture, the Kaaba, the masses of pilgrims, their movements, the sounds of uttered prayers and verses - it flooded in through the limited portals of my senses like floodwaters through a narrow chasm. Gradually, the very materiality of the things around me receded and it seemed as if I was watching only forces in motion, symbols that tugged at my mind but whose meaning I could not yet penetrate. Then, the gravitational presence of the Kaaba tugged at me and I was drawn into the tawaf. Immediately, I was caught in the press and flow of bodies. Heat and sweat engulfed me and the physical presence of the crowd of pilgrims pressing in around me became the direct focus of my concentration. I wiped at the rivulets that streamed off my forehead and walked forward swept along by the inundating flood of humanity in which I was immersed. 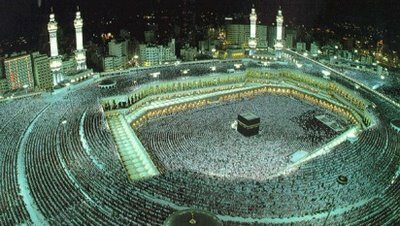 The crowd shifted and flowed around me - an organized chaos of particles they bumped along in a curved path around the Kaaba like electrons in orbit around a nucleus. Everyone was focused inwardly on their own individual recitations and concentrating on their own tawaf. In front of me an aged blind man, his pure white hair and beard glowing in the sun, leaned on a wooden staff as he performed his circuits unguided except by the sounds of the crowd and the movement of bodies around him. His free hand would rise occasionally, palm upwards in supplication as he would speak a prayer. What was it like to do this tawaf in darkness, with no visual cues, no images to process. Did he sense the looming presence of the Kaaba by his side, was he able to turn his consciousness completely inward without the incredible spectacle of the tawaf to distract him? I closed my eyes and for a few steps walked blind. Through all the circuits, the attention-commanding cube of the Kaaba loomed impressively at my left side. It's presence was powerful, intense, imposing - the extreme simplicity of it's shape adding to its stature. There was a kind of bewitching beauty to the Kaaba - here was a building stripped to it's most basic fundamentals - four walls and a roof - yet it captivated the eyes more forcefully than the architectural marvels of the mosque surrounding it. There was a wall of unmoving bodies encircling it - devotees clinging prayerfully to its cloth covered surface, their cheeks pressed firmly against its sides. It was as if those who drew too near were simply overwhelmed by its gravity and then frozen static at some timeless event horizon. And indeed, inside the Kaaba's walls was a singularity where the outward rules of religion crumbled and only the essence remained, where prayer could be performed in any direction since there lay the innermost heart of the great wheel of the Islamic galaxy, the pole within which the believer's compass spins, bewildered. My eyes took in the faces swirling around me - a vast spectrum of complexions and hues contrasting yet complementing each other, lines of great age and experience alongside the smooth faces of youths. A young woman holding her husband's hand came past me. He intoned prayers in a beautiful rhythm and tears spilled down her face. Then they were past and his recitation faded in the generalized murmur of the crowd. I grew aware of the plenitude of tears around me - some only moistening the corners of eyes, others inundating and softening deep lines in weeping faces. In these faces there was a complete absorption in the present moment. As their bodies went around the Kaaba, it seemed the real tawaf was accomplished by their hearts. When I was in the tawaf it had seemed somewhat chaotic, a complex, shifting interplay of human traffic as the masses of pilgrims sought individual routes through the crowds, their attention focused inward, each following their own meandering orbit around the Kaaba. But when later I observed the tawaf from above - from the second floor balconies of the mosque - it appeared as a smoothly turning wheel - a masterpiece of co-ordination. All the close-up complexity, the seeming chaos of individual behaviours vanished and a beautifully meshed rotation appeared - a slow revolution around an unmoving, immobile axis. There was such a gracefulness, such a superfluidity to the motion that the individuals in the crowd receded from my consciousness and I imagined I was gazing at some vast otherworldly symbol - the slow pivot of existence itself around a single fixed, immovable principle. It was as if the outward movements of the rituals provided a form, a structure that reflected, through the ritual's physical movement, a stunning spiritual geometry. It reminded me of a verse in the Qur'an in which all the human souls, from the first to the last are brought into the presence of God in a realm of pre-material existence. Each acknowledges God as Rabb (as their Sustainer) before entering into their earthly existence, before being born into this world. The tawaf was like a symbol of these human souls circling God's presence, acknowledging Him as Rabb (Lord) at each passing of the hajar-al- aswad (the black stone). Each circuit was like a descent through the different layers of existence until we leave the tawaf and enter the life of this world (the place of separation) after one final acknowledgment of God as Rabb. The hajar al-aswad seemed to me like the signet ring of a King - touched or kissed to acknowledge His Lordship. Or perhaps the tawaf is like the names of all things in existence (the names or realities taught to Adam before he emerged on the earth - as mentioned in the Qur'an). These realities circle in God's knowledge until the proper moment arrives for them to manifest in the material world. And then they descend through the layers and levels of existence till, entering the realm of time and space and cause and effect, they emerge into earthly existence. As a result it is said that everything in existence (every reality, every "name") is a messenger from the unseen world. As I left the tawaf, as I left the Kaaba, as I left the mosque, and as I left Mecca for other destinations, I felt both a powerful pang of separation and a comforting closeness towards what I left behind. The separation arose from being cut off from that which had so intensely attracted and impacted my consciousness. The closeness emerged because my direct experience of an ancient transcendental rite had inwardly magnetized me. I knew that even after I flew back to the comfort of home, some essential part of my consciousness, some essential part of my heart, would always turn, unbidden, like a compass needle to face the simple structure of the Kaaba.